This Father’s Day, we partnered with four one-of-a-kind Dads who embody the Everyday Hero campaign concept. 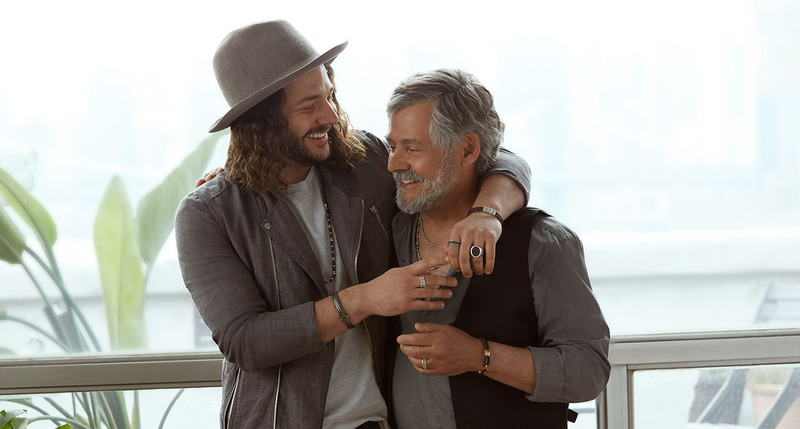 At our photoshoot, we chatted with each of these John Hardy men about the unique and deeply meaningful relationship between fathers and their children. Jason Oranzo and David Root are creatives in the fashion space and the parents to a twin son and daughter. “They have each other, so there’s always a built-in playdate!” Oranzo and Root say of their fun-loving kids. 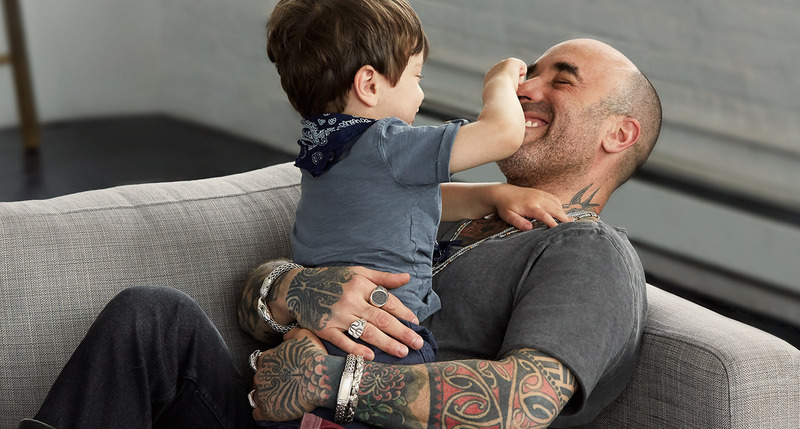 These bold and modern fathers encourage each other to seek the beauty in the everyday, and embody the philosophy that the impossible is always possible when you’re together. What have you learned from each other about parenting and fatherhood since having your twin son and daughter? Jason: David is the more patient, nurturing one, whereas I’m more of the disciplinarian. David: Yes, we’ve figured out how to balance each other a lot better. Jason: Patience is a big one. Not putting yourself first, and selflessness. Jason: And to not to take ourselves so seriously! David: We enjoy life more, because we get to relive the wonder. Christmas and birthdays have all the meaning they did when we were kids. What’s your ideal plan for this Father’s Day? Both: We want to spend the day with them doing something low key. We’ll go to their favorite playground, and their favorite restaurant. Doing what they want to do is what makes our day. Ross Brodar is an artist based in New York City and the parent to a young son. A free-thinker with a creative heart, Brodar is delighted to observe that his son Phoenix has adapted his own “quirky, goofy” side. “I see myself in him,” Brodar says. How has becoming a father inspired you? Becoming a father has inspired me to grow up in ways I never really imagined. The perspective shifts drastically because it’s not about you anymore. It’s pure joy. The joy is unparalleled to anything else. I always envisioned being a father but I never knew when it would happen. Ever since it did, it was like, ‘Wow, this is a new chapter.’ All my energy is directed in a different way, coming from a different place. An ideal Father’s Day for me would be just hanging out with the family and fishing in the woods. Phoenix doesn’t fish yet, but he’ll learn! How has your father inspired you, and what makes him an “Everyday Hero”? Mike: My father always inspired me to do what I’m passionate about, because he lives by that rule every day. I think what makes my dad an everyday hero is that his life and his lifestyle—he never does things for the attention or the acknowledgement. He gets up every day and spends every waking moment supporting people with disabilities. When he’s not with them, he’s going out and fighting for human rights or planning his next demonstration. He’s always living by a moral code, and standing up for people and giving his life for the cause he believes in. Lewis: An ideal Father's Day would be taking our family's VW Bus down to the ocean and doing a polar bear plunge. For our family, most holidays include a cold ocean dip! Lewis: As a father, the most important responsibility, and joy I might add, is furthering that which nurtures and empowers your children to be caretakers of all that they hold sacrosanct. Being a father means demonstrating, through example, ways of being in the world that are rooted in generations of family history, yet made contemporary by being sensitive to the ever-increasing demands of the present. Being inspired by your son is life's jewelry you wear each day; it's the skip in your step, the smile on your face, the essence of a father's peaceful heart. Lewis: I can think of no better place to be on Father's Day, than by the sea with my family—all three generations. Whenever my children and grandchildren visit, they make it Father's Day year round. I've come to learn first-hand that each generation offers the previous one profound insights into the meaning of life. For me, Father's Day gatherings put life's journey in perspective, and sheds light on the importance of maintaining a sense of idealism and optimism, no matter one's age. Fatherhood has inspired me to live in the moment and be present in my children’s lives. One way has been through coaching both of their soccer teams over the past few years, which has been pleasantly fulfilling and great for our relationship. What have you learned about parenting and fatherhood since having your daughter? My kids have taught me how to be patient, and how to love unconditionally. An ideal father’s day would be waking up to my kids, and having brunch in the backyard. Just spending the day with them is what it’s all about.